The Orphan Masters Son won the Pulitzer prize for fiction and was published 2012. I picked this one up with a little hesitation as it’s a thick, beastly book and indeed it ended up taking me two weeks to finish it (a long time in Jo-Land). I have long since harboured a fascination for North Korea and all its mystery so this book was right up my alley. The book follows the life of Pak Jun Do, a complex North Korean, as he goes about life. The plucky protagonist seems to live a number of different lives, starting off as an orphan and ending as a high-ranking government official under a different name. Confusing? Yes. The first part of the book is a little wordy and it did take me awhile to get into the story. I am not sure how true the accounts of North Korea are but there are so many horrifying descriptions and events that leave you reeling and hoping that they are merely constructed from the author’s imagination. Although set in recent times, this book definitely has a dystopian quality which hooks you in. As a big fan of John Green’s Youtube channel and his book The Fault in Our Stars (I cried like a baby), I endeavoured to read his other books this month to get a better idea of him as a writer. I just really didn’t like this book. Perhaps I am just a little older than the target market; I’m afraid I can no longer be classified a young adult. (Does this make me just an adult? )The book revolves around a teenage boy called Q, who has been in love with his neighbour, Margo, for years. Margo turns up at Q’s window one night and they spend the night involved in the kind of shenanigans that only happen in young adult books. After the fateful night, Margo goes missing and Q takes it upon himself to find her, assisted by a (rather annoying) group of friends. Although very similar to his other books, I think that Paper Town’s fatal flaw was that Margo was just plain annoying and Q didn’t have enough character development to carry the book alone. Margo came across as a bit of a brat (throwing away a high school education just because your parents were a bit douchey) She was a Manic Pixie Dream Girl of the worst kind. After being disappointed by Paper Towns, I approached Looking for Alaska with caution and was happily surprised. Looking for Alaska tells the story of a young teenage boy, nicknamed pudge, who goes away to boarding school and falls in love with an eclectic, bipolar young girl called Alaska (sound familiar?). Without giving too much away, drama happens, mysteries get solved and friendships grow. The character of the colonel is an interesting one and I can’t help but think that him and Pudge deserved a better friend than Alaska. Alaska seemed almost mentally ill at times (the end of the book adds to this theory). 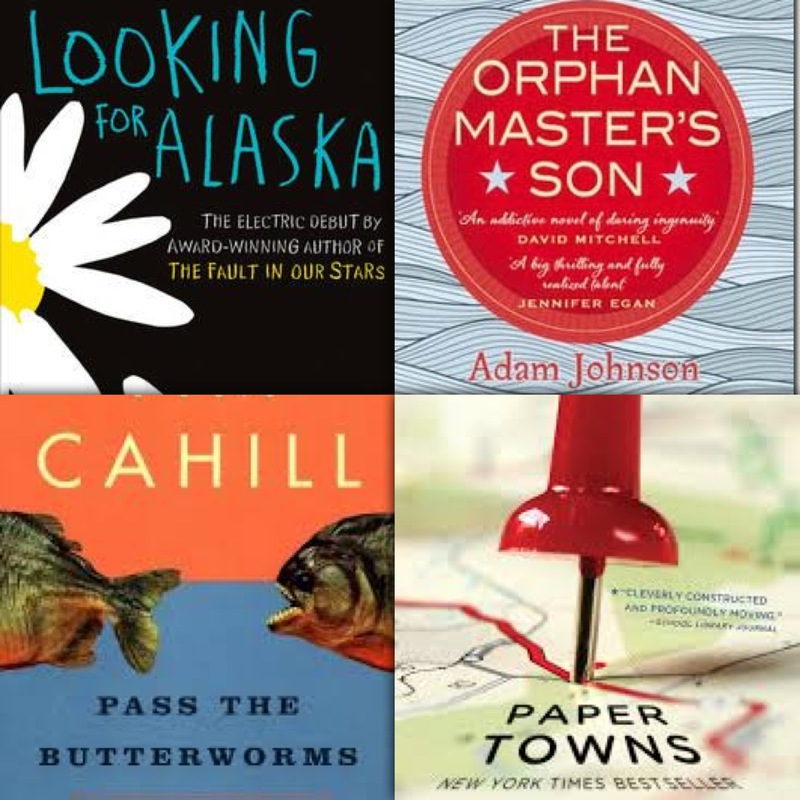 Looking for Alaska has more depth than Paper Towns as the characters are better developed and much more likeable. The philosophical undertones of the book may even make you think a little deeper about life. Let me first start by saying that Jon Krakauer is a fantastic writer. He uses words beautifully and his books are a delight to read. Into Thin Air tells the chilling tale of a season on Everest where twelve people lost their lives. Jon Krakauer offers a first hand account of how the catastrophe unfolded, and trust me when I say that you won’t be able to put this one down. His account is thorough and humble and if you are a fan of adventure books then you will love this one. This book is actually currently being made into a movie starring the drool-worthy Jake Gyllenhaal, so it’s a good time to pick this one up and give it a read. The first thought that crossed my mind when I started on this book was “Why haven’t I read this before?”. I loved his writing from the start, it is full of vibrant descriptions. Cahill doesn’t gloss over the realities of travelling and life on the road which I think happens too often in travel writing (I’m looking at you Eat, Pray, Love). The book is made up of short stories and each story is a combination of witty narrative, back ground and even a bit of history. I enjoyed the first story in the book immensely. Cahill on a hair-collecting venture (!) in Mongolia is chased down by people trying to offer him yogurt. On horse back. With a saddle bag full of noisy cheese. I can’t wait to get my hands on all his other books. I am a true believer that a good writer is a good reader and I think reading through Cahill’s works would benefit any aspiring travel writer. What books have you read in the past month? I would love to hear some recommendations or thoughts on the books I read. Leave a comment below or email me at dirtypawsblog@gmail. It’s been a really bad reading month for me. I had midterms and just got back from Jamaica where I did very little reading (I did do some, though!) I read Unwind by Neal Shusterman which was creepy but extremely interesting (it is young adult, though). I also read Memories of a Teenage Amnesiac by Gabrielle Zevin which I mostly enjoyed although the main character did start to get annoying! And I just started Angelfall by Susan Ee. I read a lot of YA… I try and use the excuse that I want to be a teacher but really I just enjoy it haha. I also did not enjoy Papertowns, though. Margo was one of the most unlikable characters I have ever encountered lol. I really like creepy books so I am sure I would like Unwind! I haven’t actually heard of any of those books (so out of the loop) so thanks so much for recommending. YA is good for easy reads, they are always really entertaining. Im so glad I’m not the only one who hates Margo, she is so unlikable.